I’ve been wanting to write about the benefits of coconut water for some time. It is surprising to me how little is spoken of this wonderfully therapeutic drink in Nutrition Science. I have seen some buzz in Sports Nutrition, but it’s clear that the use of coconut water has not become widespread as yet. It’s high time that it does. Nutritionally dense Coconut water comes from the young coconut or ‘jelly’ as it is sometimes called in the Caribbean, not the mature dark brown shelled variety that we commonly see in the supermarket. 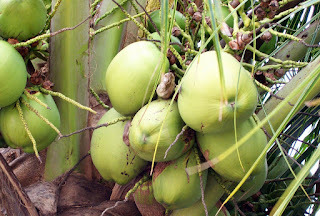 The water in the young coconut is very different from that in the mature coconut. The coconut is not actually a nut at all, but a ‘drupe’ which is defined as ‘a fleshy fruit with a single seed surrounded by a hard, protective layer”. The water does not taste like coconut milk or any coconut product you probably have tasted before. It is translucent, has a very mild flavor and no ‘coconut’ smell. It is an isotonic drink containing all the electrolytes the body needs to hydrate itself efficiently and has a very ‘cooling’ effect on the body. Its electrolyte composition mirrors that of the blood stream, and includes potassium, magnesium, sodium, and manganese. This is why it serves so well as a sports drink and a great everyday drink. Coconut water is highly sterile since the water in the young coconut is filtered many times through numerous fibers before it is finally stored inside. This process takes about 9 months, so the water is safe to drink straight from the coconut! I can tell you that this is a priceless experience to drink the water in this form. In the tropics it is always easy to find vendors with vans filled with fresh young coconuts likely picked from the tree that same day. If you take a trip or a cruise to a tropical island, be sure to embrace this once in a lifetime experience. In the US coconut water is available in the can, a carton container or in a bottle, and is more widely found than ever before.